So this weekend, seeing as how I was going to the mecca of grocery stores (WEGMAN’s) I embarked upon the mission of cooking ALL the produce left in my fridge. I had two eggplant, which I baked, hollowed out, and then stuffed with a mixture of sausage, onion, and cheese. I had fresh green beans which got blanched, and bundled wrapped in bacon. I popped them into a hot oven to let the bacon crisp up and man were they good. I had Brussels sprouts and broccoli, which got prepped, tossed with olive oil and slivered garlic, and then roasted until caramelized and gorgeous. 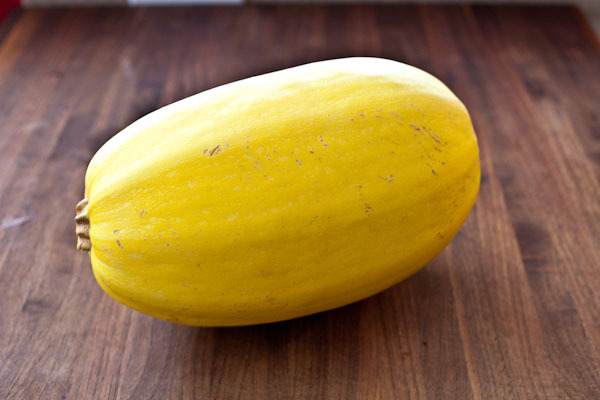 Then there was the spaghetti squash. 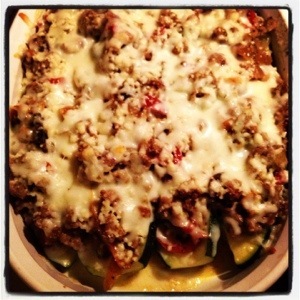 I wasn’t in the mood for “regular” spaghetti squash, I wanted something different…. something other than pretending that the squash was noodles to carry marinara. I wasn’t in the mood for marinara at all…it’s getting to be winter, it’s cold, and I needed something hearty enough to kind of act as a main dish with all these other veggie side dishes. And then I remembered it… a recipe given to me by my BFFF (Best Foodie Friend Forever) DeeJay for a “not-macaroni-and-cheese” using the squash, cheese, onion, and bacon. It has always been my belief that damned near ANYTHING can be made to taste better if you add onion, bacon, and cheese. So, I halved the squash and popped it face down in the microwave for 15 minutes to cook. While that was going on I fried up 7 strips of nitrite free bacon until they were crisp but not overly so. Setting the bacon aside on a paper towel, I poured out all the bacon grease except for a tablespoon or so and used that grease to fry up some diced sweet onion until tender and just starting to brown. I got two other saucepans out and in one I started about 4 cups of milk just to heat up to a scald. To the second saucepan I added some butter and an equal amount of my cup for cup gluten-free flour (about 2 ounces of each). I cooked these two together for a few moments, and then slowly whisked in the hot milk, dissolving all the solids. The sauce thickened up rather quickly. I added salt and pepper and then whisked in an assortment of shredded cheese I had in the fridge. I had sharp cheddar, mild cheddar, three cheese blend, and mozzarella. All of these cheeses were in the bag and were “convenience purchases” for me, so this helped me by emptying out all of these partially opened bags. I also added 2 cloves of garlic I had put through the garlic press. I kept whisking until the sauce was beautifully smooth. I have noticed that when making sauces or gravies with gluten-free flour, I almost NEVER get lumps! I buttered a shallow casserole dish and as the squash was done, I pulled it out of the microwave. I took half and scraped out the flesh with a fork, causing the “strings” of squash to fill the bottom of the dish. I chopped up the bacon, and added it and the onions over the surface of the squash. I took half of my cheese sauce and poured it over. Next, I scraped out the OTHER half of my squash and layered it into the casserole, finishing it with the rest of the sauce. Smoothing it all over with a spatula, I popped the lid on (Foil would work here too) and put it in a 350 degree oven. I let everything bake until the casserole was hot and bubbling just a bit around the edges. I pulled the lid off, dusted the top with grated Parmesan, and then let it cook another 15 minutes or so so the top could get brown and yummy. I had one piece of bacon left over so I chopped it up and sprinkled it on top just before serving. HOLY MOLY…I cannot even begin to explain just how good this was. 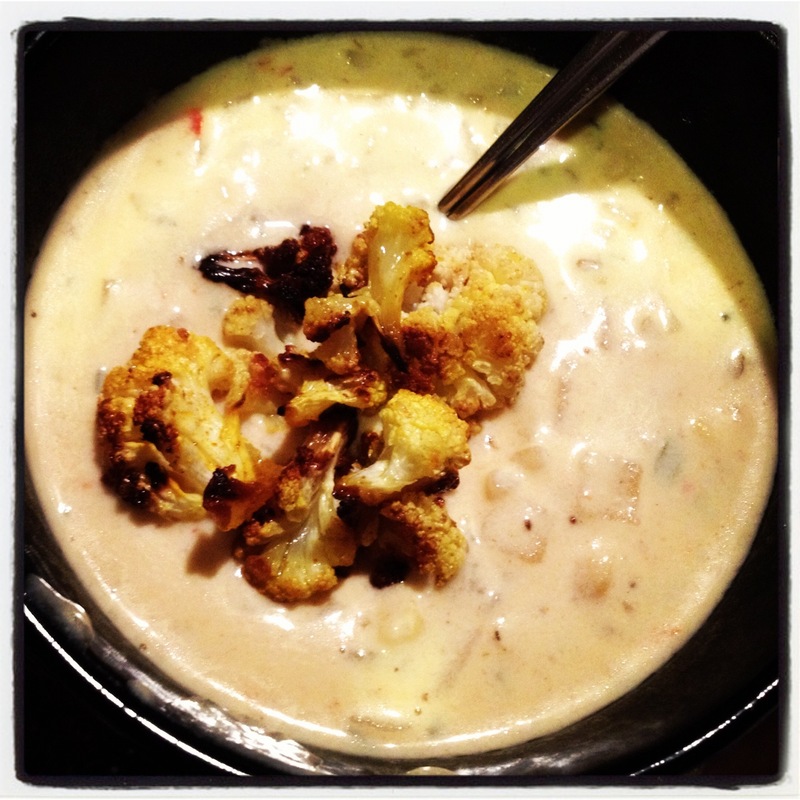 The cheese sauce baked up beautifully, light and creamy and cheesy…the onions were sweet, the bacon salty and smoky. Best of all, this was EVERYTHING mac and cheese could be, minus the heavy pasta and the OUCH from me eating gluten. So, SO good. Yet another reason my BFFF is one of my favorite people. So dinner ended up being the not-macaroni and cheese, the beans and roasted veggies, and I ended up being one very satisfied woman with a full belly and an empty refrigerator. Hope your weekend was equally savory and delicious. And the verdict is in… I’ve apparently kicked whatever started this mess, however I am now dealing with the aftermath. This hurricane of germs has left me with two wrecked and infected ears. No wonder I can’t hear so good! Also explains my balance being worse than normal…and normal wasn’t so hot to start with. I needed to eat to take the medicine prescribed to me, and I wanted comforting, so I decided to whip up some soup. I took a look at what I had in the pantry, and decided on a chowder. It rained like the dickens here today, and I was being all pitiful, so I wanted comforting. I had potato, and celery, and a few fresh ears of corn. I had bacon, onion, and garlic. I needed half and half, so that meant a call to the spouse to pick up a quart on the way home. He did, and forever became my hero. Melt the butter in a dutch oven and add the bacon, cooking until crisp. Spoon the bacon bits out and drain on a towel. My bacon was SUPER lean, but if yours isn’t, dump out all the bacon fat except about 1/4 of a cup. Add the onion, celery, carrots, and peppers with a little salt and pepper and cook until the veggies start to soften. The carrots will take a while, so don’t sweat it if they aren’t as soft as the rest. Throw in the garlic and cook for 1 minute more.. don’t burn the garlic! Add the corn starch (Or flour for those of you OK with the gluten) and stir around to cook out the raw starch flavor. Now add the chicken broth and potatoes and give a stir. Raise the heat slightly, cover, and simmer for 10-15 minutes until the potatoes are tender. Add the corn and cook another 5-6 minutes to allow flavors to meld. Remove from heat and stir in the half and half. Season with thyme, a pinch of cayenne, salt, and freshly ground black pepper. Just before serving, top with the parsley and reserved bacon bits, stir once more, and ladle into bowls. I had been fortunate enough to roast some cauliflower today too. Fresh florets tossed with olive oil, kosher salt, cumin, and turmeric, and then roasted in a 400 degree oven until crisp-tender. I took a few of those florets and floated them on the top of my chowder. Delicious, and completely comforting. Exactly what a sick girl needs to feel better. Pre-heat oven to 400 degrees F. In a large bowl, combine the cubed eggplant, squash, and bell pepper. Add a bit of olive oil and toss to coat. Season with salt and pepper. Pour vegetables out onto a foil lined sheet pan, arranging in a single layer. In the same bowl add onion. There may be enough oil in the bowl left to coat the onions, if not, add as needed. Season with salt and pepper, and turn out onto a separate foil lined sheet pan or small baking dish. Place BOTH pans into oven. Roast until the vegetables start to get tender and a bit brown. Keep an eye on them! You don’t want them to burn, and the onions WILL finish first. If you find that the peppers are browning too much before the eggplant and squash, pull them off the pan as they become done. Meanwhile, in a Dutch oven (or other heavy 5-quart pot with a tight-fitting lid), heat a little olive oil over medium heat, and add the garlic; cook until fragrant, about 1 minute. Stir in tomatoes and thyme and bring to a boil. By this point your onions are probably done, so as they finish in the oven, pour them into the pot with the tomatoes and garlic and stir well. The rest of the vegetables will be nearly finished by now, so add them to the pot once they are ready. Bring the vegetables to a simmer, then reduce heat to medium-low. 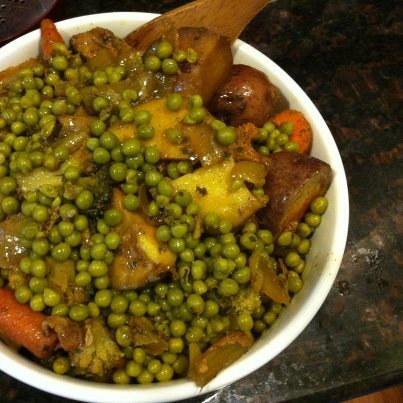 Partially cover; simmer, stirring often, until vegetables are tender but not mushy, about 10 to 15 minutes. Remove from heat and stir in basil if serving immediately. This recipe freezes well, just leave out the fresh basil. When reheating, add the basil right before serving; the heat from the dish works its magic to draw that basil flavor into the mix. For convenience, you can also roast all your vegetables to completion before starting the tomato base. That way you can pay strict attention to your veggies without worrying that they will burn. Remember when you add all the roasted components to dump the whole pan in, you want the oil and any juices in the bottom of the pan. Eat this as a side dish, toss with pasta, you can even rest a little grilled chicken on top for an all in one dinner. Roasting gives the vegetables much more flavor, adding them and their juices along with more seasoning to the tomato base really helps round things out and mute that very “in your face” flavor that tomatoes can sometimes have. Delicious! Oh, and for what it’s worth… my son didn’t like it. Go figure. This is my dinner. Yes, it’s ice cream. A Turtle Sundae to be exact. Vanilla ice cream, chocolate syrup, caramel, pecans, whipped cream, and a cherry. 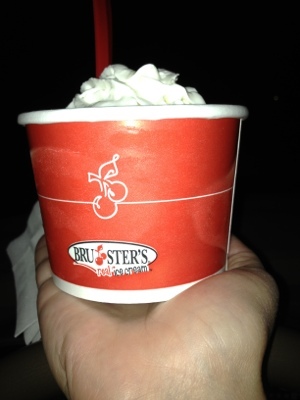 I am having ice cream because I got a call this afternoon for a job interview tomorrow morning. This is an interview for a job that would forward my career. This is a job that I want very much. This is an interview process unlike any I have ever experienced. This is me – nervous. I am stressed. Do not judge me. So I ask you all, do you eat when you are stressed? What do you eat? Does it help? If you could spare some good luck vibes, it would be VERY much appreciated. And if tomorrow’s dinner photo is of vodka, you’ll know it didn’t go well.